← Systemic racism is the main reason why we tolerate statistics regarding our criminal justice system. Fifty Shades of Fundamentalism: So who is a Fundamentalist? 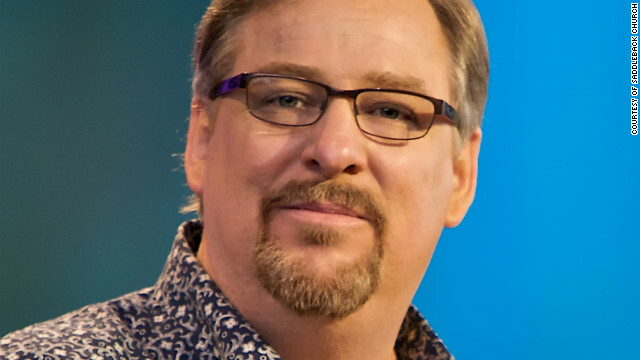 Rick Warren – A more mainstream Fundamentalist. So far I have described the basic contours of Christian Fundamentalism and described how the main problem I see with it is that it creates a worldview in which it is impossible to recognize its most fundamental flaw: its widespread reliance upon unassailable ignorance to continue. The next and final aspect of Fundamentalism I would like to examine is who is actually a Fundamentalist. As I have said previously, Christian Fundamentalism is not just a belief in the Five Points of Fundamentalism (which most Christian groups would affirm), but many other attitudes and behaviors beyond that, especially a defensive posture against some imagined hostile secularizing threat. Because Fundamentalism is more about holding to other attitudes and this defensive posture than a specific set of doctrinal beliefs, estimating who is a Fundamentalist goes far beyond the scope of people who would overtly declare themselves to be Fundamentalist Christians and are direct heirs of the Niagara conference. From all of this, I would suggest that Fundamentalism is best understood as a spectrum rather than a concrete label. On one end there are certain groups who embody these values to the extremes and ones who self-identify as Christian Fundamentalist. However, there are not the only people I would consider Fundamentalists. Scaling back from this extremes and going towards the other end there are many shades of Fundamentalism. There are many more Christians who, to varying degrees (or shades – see what I did there), approach life and faith from within the Fundamentalist worldview. The degree to which they exhibit Fundamentalist beliefs, behaviors and attitudes in their life and faith is the degree that I would consider them Fundamentalist. What I am suggesting is contradictory to contemporary practice, especially among American Protestants. When it comes labeling/admitting Fundamentalism, most Christian communities practice a form a self-righteous labeling. What I mean by that is that just about every church, denomination or theological stream within Christianity does not want to be seen as Fundamentalist. They know there is a stigma attached to this label for good reason, and they may even recognize some of the errors I have seen or the problematic use of unassailable ignorance. Few groups would adopt the label of “Fundamentalist” and they always tend to label other Christian groups that they think are more extreme as Fundamentalists while they themselves are not. This is done to avoid the stigma of being labeled as a Fundamentalist and also to avoid having to deal with the shades of Fundamentalism that often exist within the community, especially the problematic parts. This is also inaccurate and deceitful. In my experience and perception, American Protestantism in general is rife with Fundamentalism, to one degree or another. There are many Christians who believe in some variation of the “culture war” narrative and believe that Christianity is under attack by non-Christian forces. There are many Christians that take a defensive posture against anything not of their brand of Christianity. There are many Christians who see the world with a black and white worldview. There are many Christians who desire to be unchallenged leaders or to have an autocratic leader that will just tell them what to do and believe. There are many Christians who retreat to unassailable ignorance and refuse to engage with or examine anything that will challenge their present worldview. The people who make up the various shades of Fundamentalism are a diverse bunch. They come from all different Christian groups, ethnic groups and socio-economic positions. While they function as Fundamentalists in many ways, they seek to avoid the label of Fundamentalist, and self-identify in other ways. Many “Main-line churches,” “Mainstream Christians” and “Conservative Evangelicals” in my experience are moderately to highly Fundamentalist in their practice, culture and thought. To me the people who operate as Fundamentalists in many ways but do not claim the label of Fundamentalism are more dangerous. What I mean is that the extremists are rather easily recognized, they are in the minority, and they are usually safely ignored by most of society. While they do damage the image of Jesus Christ and Christianity in general, and often garner headlines for their antics, they are at least mercifully small in number. However, people who are slightly more moderate and avoid the label of Fundamentalist people who slip by the stigma and the association with Fundamentalism, while many of their behaviors and practices remain the same, are far more numerous. The defensive posture towards the rest of culture persists. The theological arrogance persists. The black and white worldview persists. The autocratic leadership persists. The widespread use of unassailable ignorance persists. And they escape being called to account because they squirm away from the label of Fundamentalism and are at least a couple of steps away from the extreme. For my Christian readers I encourage you to ask yourself if you are you a Fundamentalist? Do not just look at your church documents or the name of your brand/sect of Christianity. Do not just consider the stigma that may be associated with Fundamentalism? Look at the attitudes, practices and beliefs that exist and are fostered in the community’s culture and exemplified in its leadership. Practice some introspection and look at some of your own life and faith. Do you believe America was a once great Christian nation and need to come back to its Christian roots? Does your church espouse one model of gender relations and consider all others to be “unbiblical?” (and therefore inappropriate). Have you wanted to question a teaching of the church or a leader but not spoken up because you knew you would be shunned or shamed? Have you seen anyone share a dissenting opinion, criticism or question be “shut down” by church leadership? Do you believe that there are human groups out there actively plotting and attempting to erode Christian morality and teaching in the U.S. and elsewhere? Does your community tend to judge outsiders? Harshly? Fairly? Softly? Depending on their level of repentance? Does your community believe all other Christian sects are wrong? Are there a number of unspoken rules in your community that people implicitly know they must obey? Do you feel that it is your job to defend Christian values in the U.S.A. and elsewhere? Does your community foster critical thinking or rather uncritical obedience and belief? Does your community have a leader who is clearly the head/face of the church? Are you a Creationist? If so, have you seriously examined the evidence for and arguments for Evolution? Have you considered a Theistic Evolution stance? How seriously do you consider alternative interpretations of the Bible offered by other Christian groups? Do you seek to study and understand them, or dismiss them as false automatically out of hand? Have people been kicked out of your church for disagreeing with leadership? Does your community support schools like Talbot, Biola, Liberty, and Dallas Theological Seminary? Does your community believe all other types of Christians are going to Hell and only your group is really saved? Does your community believe only men should be in leadership? Is your community Dispensationalist at all? Does your church talk a lot about the actual contemporary nation-state of Israel and believe our treatment of Israel has some control over when Jesus will return? Does your leadership have any sort of accountability? How literally do you take the Bible? How do you explain the fact that everyone takes some of the Bible literally and other parts of it not literally? How do you explain your own practice of this? Is talk about issues within the community discouraged or disallowed completely, often by labeling it as “gossip”? Does your church beliefs about the end of this world in any way resemble the “Left Behind” series? Does your church have (on paper, or in the culture) a number of beliefs that one simply must believe or one is not a Christian? I am referring to here to things beyond basic fundamental Christian doctrines and more thinking of specific stances towards immigration, homosexuality, abortion, politics, etc? Does your community reach out to other religions or vilify them? Is your community Calvinistic in its leanings? Is your leadership and community ethnically, demographically, politically and in other ways diverse or are you all conformed to a rather specific mold? Does your community mock those who think we “Came from monkeys”? Does your community value of education, both theological and non-theological in nature? Are shame and guilt used as controls commonly within your community? Are there clear groups of people who would not be welcome at your church? Are there people who you would identify as “The Enemy” of your church and the Christian faith? Do you tend to go along with the general current in your community or is your faith and beliefs the result of intense prayer, study, engagement with alternative viewpoints and digging into hermeneutics and Greek and Hebrew? Do you or anyone else in your community have a fairly nuanced understanding of the beliefs of other religions and other sects of Christianity? Compare yourself to what I have said previously about Fundamentalism. Consider your answer to these questions. Take a moment and do some soul-searching. You might be more Fundamentalist than you realize. This entry was posted in Christianity and tagged Christian Fundamentalism, conservative evangelicalism, Fundamentalism, Rick Warren, Spectrum of Fundamentalism. Bookmark the permalink. 2 Responses to Fifty Shades of Fundamentalism: So who is a Fundamentalist? You really should consider publishing a book on this (self-published, if necessary) – This is very eye-opening, thanks! Thank you, I appreciate the feedback. I still have one more post to go.